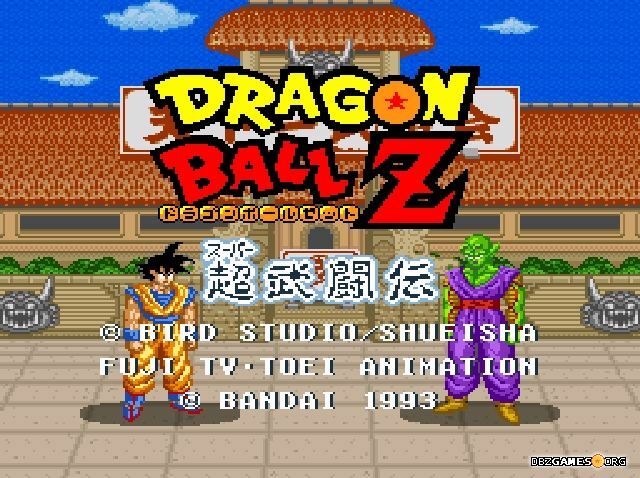 Dragon Ball Z Super Butōden 2 is a classic fighting game developed by TOSE Software and released by Bandai for Super Famicom/Super Nintendo on March 20, 1993 in Japan, and on November 30, 1993 in France and Spain. It's the first game in Butōden fighting game series and first Dragon Ball game released on this console. A digital version of the game was also available as a bonus to pre-ordered Dragon Ball FighterZ for Nintendo Switch. Dragon Ball Z Super Butōden started the Butōden series, which includes many Dragon Ball fighting games released in the following years - such as Dragon Ball Z Buyū Retsuden, Dragon Ball Z Hyper Dimension, Dragon Ball Z Shin Butōden, or Dragon Ball Z Extreme Butōden. The series was created by Toshihiro Suzuki, a game designer who also worked on the Street Fighter games. At the moment, 10 games have been released as part of the series and it's not said that no more will appear. The first Butōden game is set in a very long period of time from the end of the first Dragon Ball TV series to the conclusion of Cell Games Saga, thus the story covers events from almost whole Dragon Ball Z, without Buu Saga. Of course, the game tells about only few important pieces of the original story, omitting events such as the fights against Radtiz, Nappa, or Ginyu Force. That would require practically doubling the game's roster and closing down many possibilities for the next parts of the game. The events that were added, reflects the original Dragon Ball story pretty well, and at the same time gives the player an opportunity to affect them by choosing a character to fight against specific opponent. The combat system looks very similar to other fighting games from the 90s, however, developers have implemented a quite innovative solution for this genre - split screen. This allowed creators to add huge stages and make struggles more similar to those known from the manga and anime, where sometimes gaining distance from an opponent to prepare a powerful attack was the key to victory. As fighting at such a large area can be a bit confused, developers have placed a radar below health and energy bars, thanks to which the player always know where the opponent is at the moment. Each character has a set of basic punches, kicks, and Ki blasts which, when properly combined with the D-Pad, can turn into deadly combos. 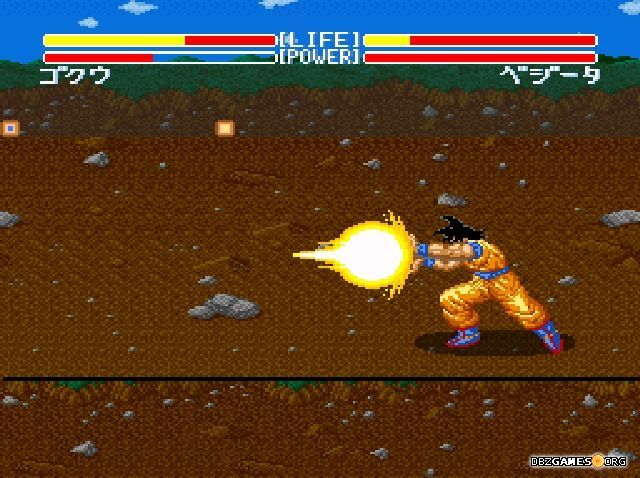 The game also features iconic attacks like Kamehameha, Masenko, Final Flash or Special Beam Canon. Super Butōden has several unique solutions. For example, it's the only game from the series with possibility to dash into the opponent to knock them down, as well as it's the only game without the ability to quickly build Ki. The game has a lot of various options such as button mapping, toggle HP and Ki bars, toggle radar, toggle slow motion, global difficulty level, or number of available continues in Story Mode. 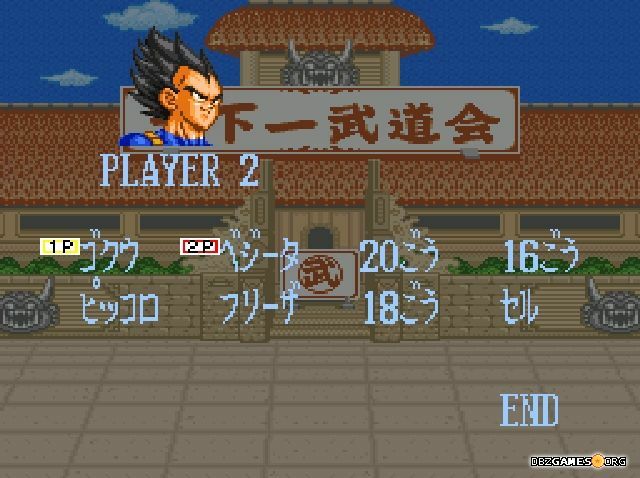 Super Butōden contains three game modes: Story, VS, and Tournament. Story is designed for one player, but both VS and Tournament have a multiplayer mode. 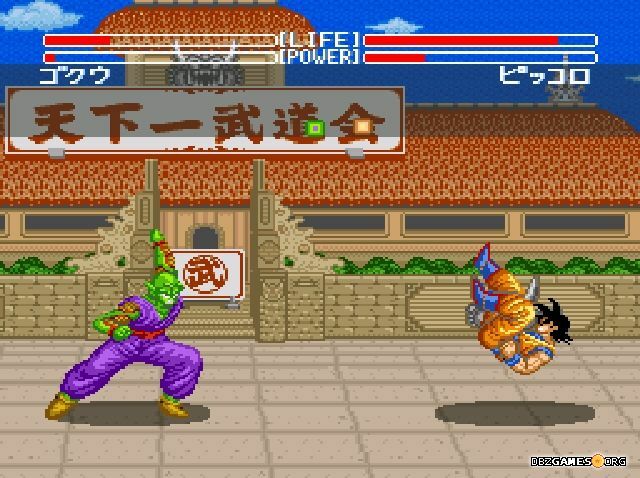 Story Mode begins from the last duel between Goku and Piccolo at the end of Piccolo Jr. Saga. 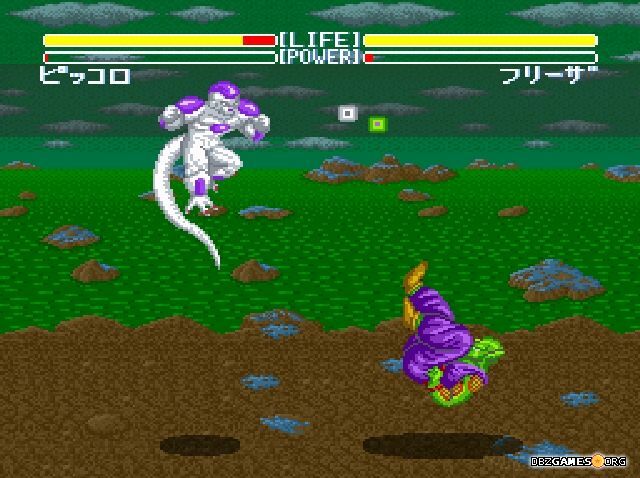 Then the player will fight against Vegeta, Frieza, Androids, and Cell. There are also a few sparring fights, for example with Future Trunks and Gohan. 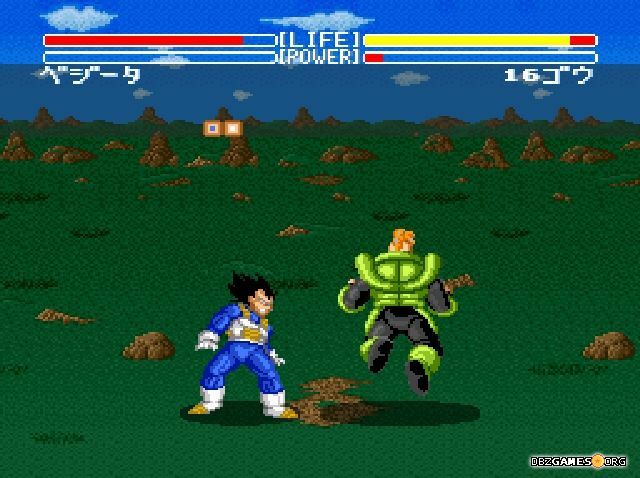 Starting from the second battle (against Vegeta), the player can choose a character who will face the opponent. Through 10 story fights, the player can play as Goku, Piccolo, Vegeta, Future Trunks, Gohan, and even Android 16. After last fight, if all the battles were won on the first attempt, a character choices for specific opponents matched the original manga story, and the difficulty level is set at 3 or 4, one bonus battle will be unlocked, in which Mr. Satan will be able to "participate". 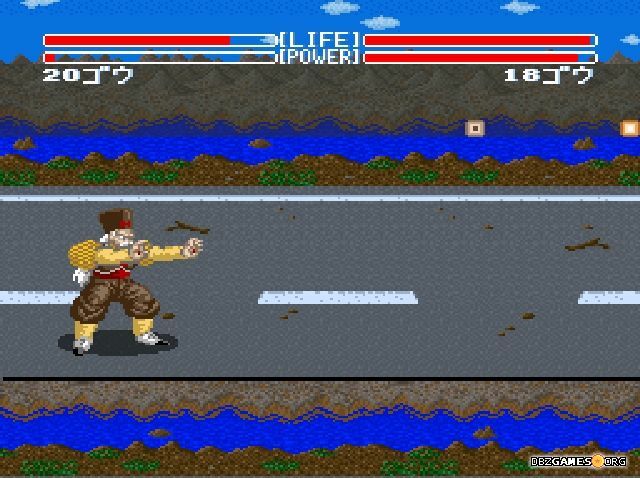 VS Mode allows the player to fight against a selected opponent controlled by a computer AI (1P vs CPU) or a second player (1P vs 2P), as well as watching the fight of two characters controlled by CPU (CPU vs CPU). There are many options that can be set immediately before the battle, such as health and energy amount, attack mode, level of difficulty, map, and music. After the fight, the player (or players) returns to the character selection screen. Tournament Mode is an equivalent of Tenkaichi Budokai known from manga and TV shows. Up to 8 players or characters controlled by computer AI can compete for the title of the best fighter. After selecting characters by all players, the remaining free places will be filled by characters controlled by CPU. The tournament starts at the quarterfinals round. The winner of each fight goes to the next round, and the loser ends the competition. The best four warriors emerge two who will face each other in the grand finale. At some point during Story Mode mode, the player can choose Mr. Satan as a fighter who will face Perfect Cell. Unfortunately, he is not a playable character, but only a humorous addition. It's a bonus battle, which takes place after meeting few requirements (details in Game modes). After being chosen the first time, Mr. Satan will try to fight Cell, which ends only with his knockout. During the second time, he will complain about a stomach ache and fall down before the fight can even begin. This is the end of Mr Satan's participation in Cell Games and the entire Dragon Ball Z Super Butōden. The game includes 9 different stages and each of them we could see during more or less important moments from the very beginning of Dragon Ball Z to the conclusion of Cell Games Saga. World Martial Arts Tournament arena where Goku and Piccolo fought during Piccolo Jr. Saga at the end of the first Dragon Ball series, the canyon where Z Fighters and Goku struggled with Nappa and Vegeta, Planet Namek, Hyperbolic Time Chamber, or Cell Games Arena where Gohan definitely defeated Perfect Cell. These are just a few of the iconic places that the player will experience once again during the game. Each stage has 2 levels, the ground and in the air, between which characters can move freely when they are far away from each other - in other words, the screen is splited. In the air, a characters can't crouch, but it doesn't limit the attack possibilities. Swap between levels allows the player to move away from an opponent and accumulate more energy to perform a special attack or just dodge opponent's Ki blasts (special attacks can't be dodged in this way). The game sold 1.45 million copies and takes 30th place among the best-selling games for the Super Nintendo/Super Famicom console. Although the leading games from this list have sold a few to a dozen times more copies, it's still a big success. Of all games based on Dragon Ball franchise released for this console, except Super Butōden, only one game has sold more than a million copies - the sequel, Dragon Ball Z Super Butōden 2. Super Butōden had pretty good press in France, where received ratings between 72 and 88%. The game got high rates for innovative gameplay, but some magazines criticized average graphics. Dragon Ball Z Super Butōden 2, the sequel to the game was released on December 1993 in Japan, and on June 1994 in France and Spain. 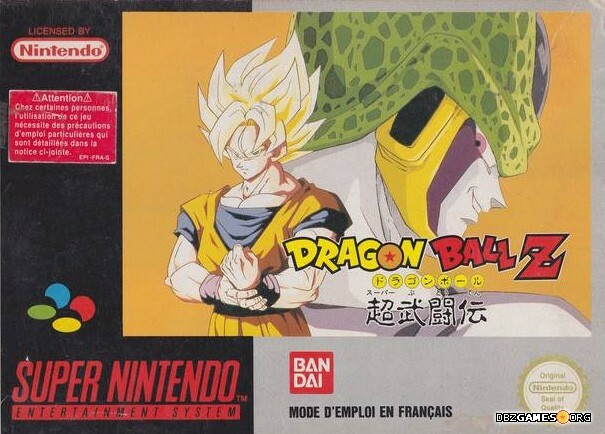 The third and final game from Butōden series with the subtitle Super Butōden, Dragon Ball Z Super Butōden 3, was released on September 29, 1994 in Japan, and on March 1995 in France and Spain. 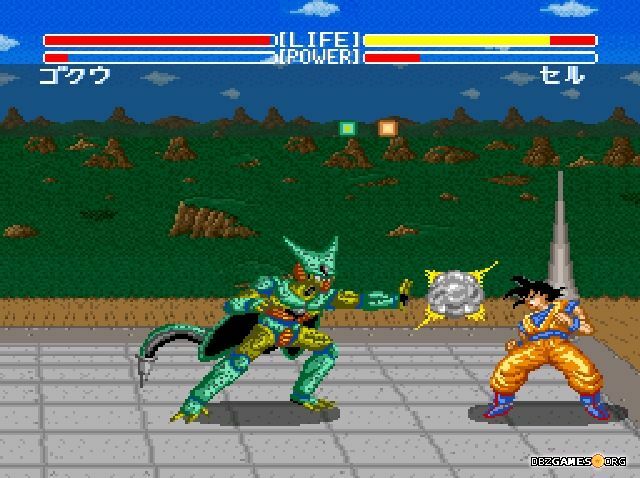 The fourth and final game of the series for this console was Dragon Ball Z Hyper Dimension, released on March 29, 1996 in Japan, and on February 1997 in Europe.